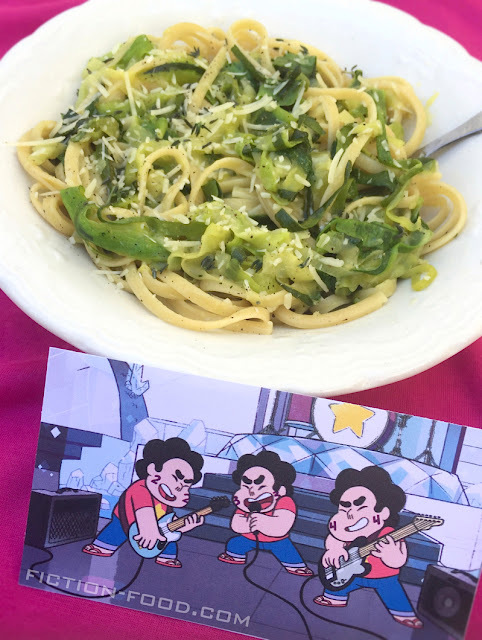 Fiction-Food Café: Zucchini Linguine for "Steven Universe"
Zucchini Linguine for "Steven Universe"
In episode 22, season one, of Rebecca Sugar's "Steven Universe" on Cartoon Network, Steven manages to gather several versions of himself via time travel and creates a band called "Steven and the Stevens". After a short time passes though, the other Stevens get fed up with Steven prime's leadership and kick him out of the band! They sing this song to let him know how they feel, but only the first three lines are sung at the time because Steven1 pulls the plug. The song is played in its entirety shortly thereafter as background music while the Stevens fight and travel through their timeline. Steven's a big fat meanie! A big fat meanie zucchini! Let's chop it up, chop-chop it up! And serve it with Linguine! Al denteee! Al denteee! Al denteee! Al denteeeeeee! 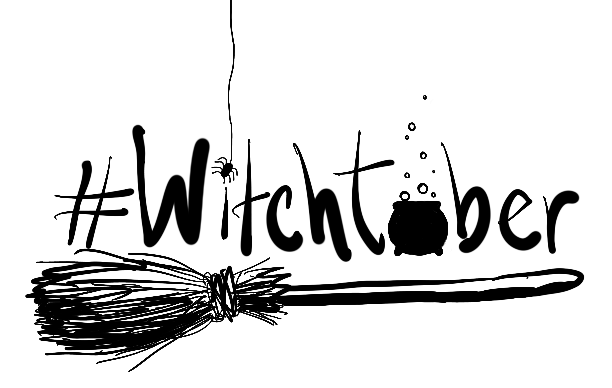 How nice to give a recipe in a song–I couldn't pass it up! 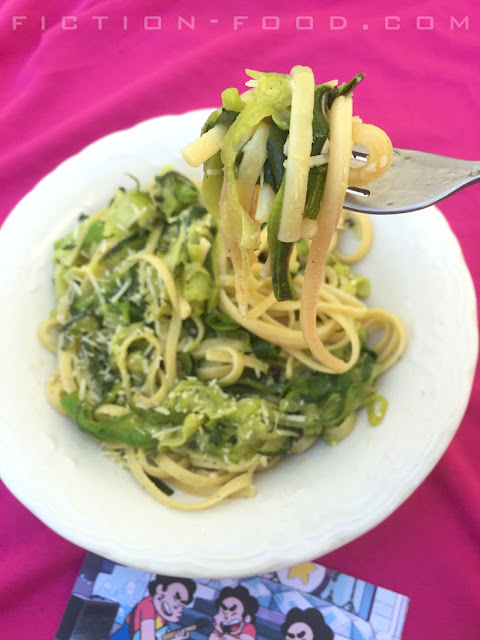 You've got chopped zucchini plus linguine cooked al dente (den-tay). 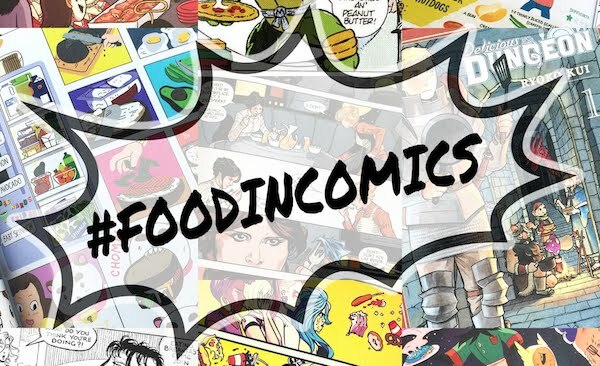 It's very simple and yummy! 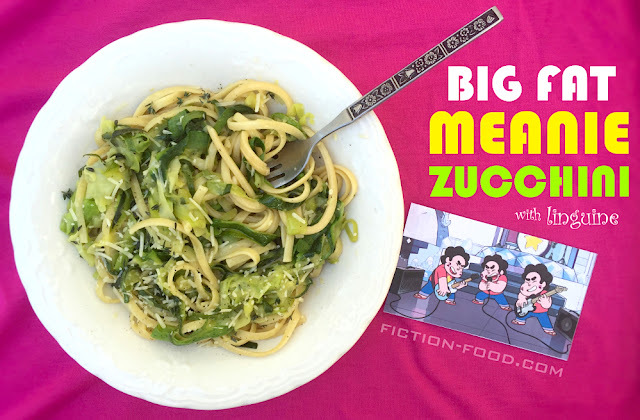 The "Big Fat Zucchini" song was composed and written and guitar-ed by "Steven Universe" writer and story boarder Jeff Liu, with drumming by Roger Hicks, and vocals by Zach Callison, the voice of Steven Universe. You can listen to the "Steven and the Stevens" episode soundtrack, composed by Jeff Liu, here. Seriously, peoples, the music for "Steven Universe" is continually incredible, constantly impressive. I've made a playlist and listen to it often as background for my prosaic life; doing computer stuff, kitchen stuff, stuff stuff, I love it (I'm listening to it right now as I make this post). 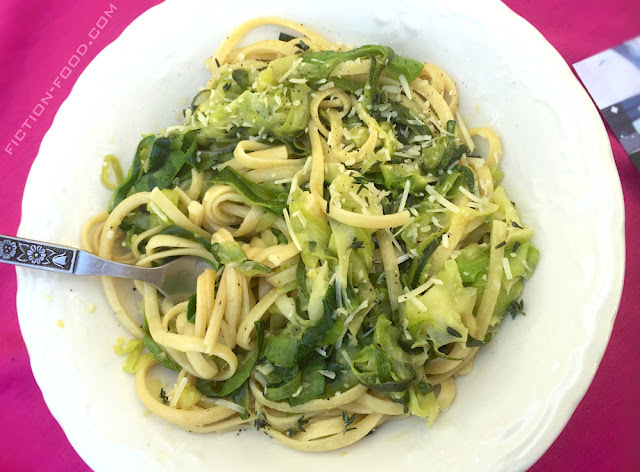 Note: For the recipe below, I decided to cut the zucchini into strips, but feel free to chop it into bite-sized pieces if you'd like, just make sure you cook them until they're tender. 1. In a medium-large pot, bring about 4 cups or so of lightly salted water to a boil & then add in the linguine (do not break it!). As the noodles soften, gently push all of them under the water & boil for about 8 minutes more or until the center is no longer white. Scoop out 1/3 cup of the noodle water & drain the rest. Sit the noodles to the side. 2. In a large pan on medium-low heat, melt the butter. Using your peeler, peel the zucchinis length-wise until you get to the seeds. Place the peelings into the pan with the butter & cook for a few minutes, just until tender. Increase the heat to about medium & add the noodles, reserved noodle water, salt & pepper to taste, lemon zest, & thyme. Toss & cook for a few minutes more, until everything is combined & cooked through. Scoop into a serving dish, sprinkle with optional parmesan, & enjoy, you meanie!